In South Korea, May is the month celebrated across the nation for families to show appreciation for one another. With Parents’ Day just around the corner, flower shops receive greater bundles of orders for flower gifts to be presented to parents. Taking on a fresh perspective on flowers, owner-artist Jung Jun-ho of “Peony Pepe” flower shop is one of a few up-and-coming male florists in the nation. Compared to other Western cultures where florists are mostly male, the occupation is more preferred by women here. The flower shop’s name is essentially the pairing of Jung’s favorite flower and plant: peonies and aloe pepe. 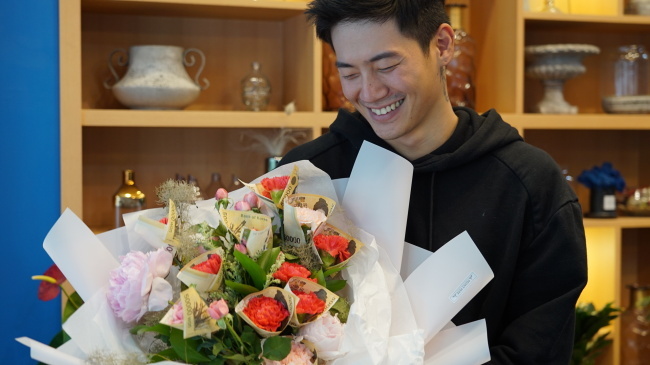 Prior to opening his shop four years ago, Jung used to be a mobile application developer, but was instantly lured by the artistic finesse that the job requires after taking lessons from London’s finest florists. 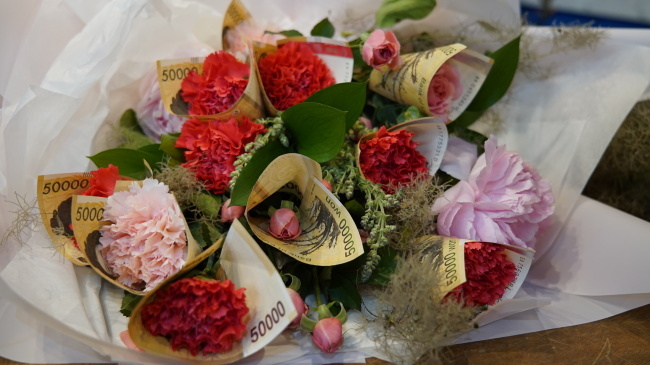 Jung, who holds a Jane Packer certification, explained that the success of his flower shop is underpinned by his passion for generating new designs, such as the popular money-wrapped carnation bouquets, money flower boxes and money roses. The process of creating money-wrapped flower bouquets appeared deceivingly easy as Jung demonstrated the craft. With swift movements of his hands, he also showed how to make a rose out of five 50,000 won bills. “Believe it or not, there are 31 flower shops just within the block. So, I try to splash our shop with a more creative, competitive edge. Couldn’t you tell just from our shop’s exterior?” Jung said laughing. In order to survive in the crowded market, Jung laid out his daily schedule packed with tasks from dawn to nighttime. Waking up at 4 a.m., Jung visits the local flower, plant and packaging markets, scouring for the best quality products to embellish the shop. Flower shopping normally takes two to three hours because of his “picky requirements,” ranging from stem length to bloom duration. “Flowers are classified into different grades, so to speak, and I only pick out the best for our customers,” he said. Unlike other local florists, Jung does not depend solely on flower sales. From holding one-day group lessons to planning corporate events, the florist appeared motivated to expand his career into visual merchandising. The use of flowers in product marketing has been on the rise in recent years, according to Jung. Working closely with big name brands such as the Coca-Cola Company, Jung has come under the corporate radar. Among the many corporate events, Jung picked his work at a pharmaceutical company to be the most memorable. He had embellished a photo booth with flowers in laboratory beakers that had medicinal pills instead of water. Asked about the most memorable experience at the shop, Jung described his encounter with a client who brought a rope to tie around the flower basket, which was intended for a marriage proposal. Jung also shared his observations of odd behaviors by male customers. They would come into the shop, holding empty luggage bags because they felt reportedly embarrassed to carry them by hand. Because flowers can shrivel and die easily, Jung recommended placing vases filled with cut-flower bouquets in cool, room temperature places to avoid sunlight and replacing the water every two to three days. 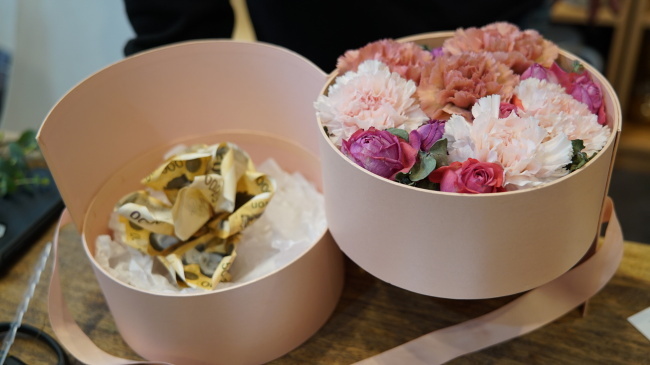 In response to the growing demand for flowers with longer blooming periods, Jung said he offers customers with flower boxes or bouquets with preserved flowers. 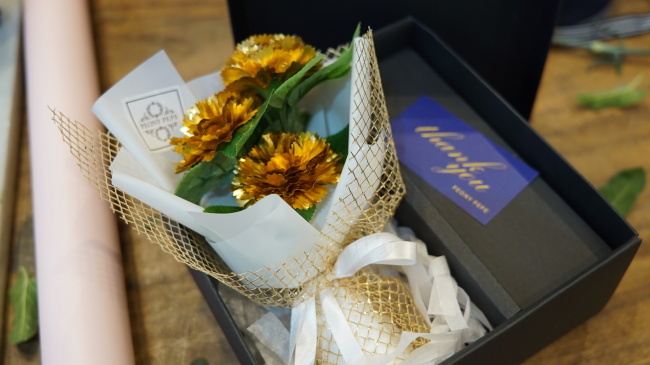 Contrary to the public assumption that the flower market is struggling to stay afloat, Jung expressed his gratitude towards the many customers in their 20s and 30s, saying that young people take keen interest in the group lessons and custom orders. The florist said his social media marketing techniques contributed greatly to the flower shop’s success, revealing his plan to establish a stronger presence in the flower market.